Welcome to the latest edition of Flexible Boss – sporting a new look. In the spirit of flexibility and accessibility, we’ve moved on from the old page-turn PDF format. While pretty, it wasn’t very mobile friendly or searchable so we hope you’ll find this easier to navigate. All feedback is welcome so please get in touch with any comments and suggestions (heather@flexibleboss.com). This quarter, we take a look at shared parental leave’s progress in the workplace, especially relevant given government’s announcement that it plans to bring grandparents in on the act. 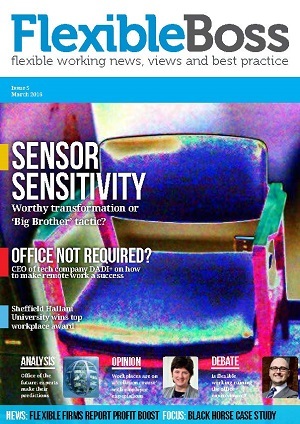 We also have features on personality testing & flexible work, plus a profile of Regus CEO Richard Morris and Q&A with Canada’s Workshift executive director Robyn Bews. She leads a city-driven approach to flexibility, something we have yet to see implemented in the UK. Also, there is a great line up of expert opinions on all aspects of flexible working and case studies from ABN Amro, creative agency Rufus Leonard & the Co-op. Personality testing and flex work: useful tool or ‘total tosh’?